Liverpool legend, Steven Gerrard has said that Mohamed Salah is the best player on the planet after another excellent performance against Roma in the Champions League on Tuesday. 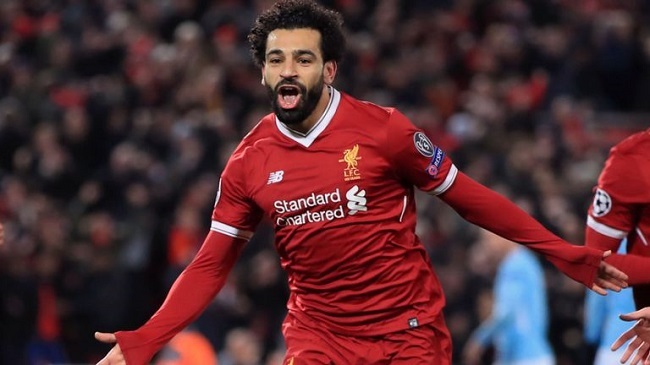 The Egyptian struck twice in the first half of Liverpool’s thumping 5-2 victory over Roma. He then set up both Sadio Mane and Roberto Firmino for tap-ins. Salah’s brace means he has now scored more goals than any other player in Europe’s top five leagues this season across all competitions. The former Roma man has netted a staggering 43 times this season – one more than Cristiano Ronaldo and three more than Lionel Messi. Gerard believes Salah is now playing at a level above Ronaldo and Messi. The former Liverpool skipper told BT Sport after the game, “He’s in the form of his life. “It’s difficult to compare him to your Ronaldo’s and Messi’s because they’ve done it for so long and they’ve been consistent year in, year out. The Egyptian international’s double against Roma also takes his Champions League tally this season to nine goals. With that, he becomes the most prolific Premier League player in Europe since Ruud van Nistelrooy.